Divorce is formally called “dissolution of marriage” in Washington State. In Washington State, common law marriage is not recognized. You have to be legally married for the court to enter a Decree of Dissolution. Washington State does recognize domestic partnerships, and if two people are registered as domestic partners with the state, then they must dissolve their domestic partnership through the courts. That process is similar to a dissolution of marriage process. When a person gets married when they already have another spouse, then the second marriage will not be considered valid. Washington is a “no-fault divorce” state, meaning there is no need to assign blame or prove that the other spouse is at fault for the failure of the marriage. According to Washington state laws, only one spouse in the marriage must believe and declare that the marriage is irretrievably broken in order for the divorce decree to be granted. “Irretrievably broken” means that the marriage cannot be saved, and there is no chance of reconciliation. Who can file for a divorce in Washington? You can file for a divorce in Washington if you or your spouse currently reside in Washington state. You may file in the county where either you or your spouse lives. Alternatively, you may file in Lincoln County even if neither of you lives there. Both spouses have to agree for the case to be filed to file in Lincoln County. The minimum waiting period for a divorce in Washington is ninety (90) days. This is the minimum period required before the court will finalizes your divorce. The “ninety day” clock begins running after the Petition for Dissolution of Marriage is filed and then served on the non-filing spouse. If both spouses sign the Petition, then the clock begins running once the Petition is filed. Ninety days is the minimum time it will take for a Decree of Dissolution to be entered. However, it will likely take longer if there are disputed issues that exist when the dissolution process begins. 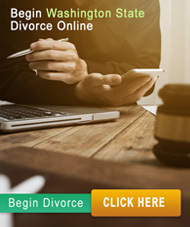 These disputed issues could be related to the division of property and/or debts, aspects of the divorce related to children, maintenance/alimony, or any other issues. Many other issues could delay the process as well. During the three month waiting period, temporary orders may be entered to address interim issues including a residential schedule for children, financial support, or use of property. If you and your spouse can agree on all issues, then you will be making the best out of a bad situation. By agreeing on all issues, you’re more likely to get along better after the divorce – something that is very important, especially if you are have children together. Additionally, you save money. The cost of an uncontested divorce is significantly less than the cost of a contested one. If you’ve agreed on some issues – but not all – but you want to work together to try to achieve a resolution efficiently and without fighting, then mediation may be an option for you and your spouse. Mediation in divorce requires a mediator or a trained neutral, often a lawyer or mental health professional, to help divorcing spouses reach agreement. While divorcing spouses routinely participate in mediation when they are represented by attorneys, it is not uncommon for spouses to participate in mediation with a trained mediator and without their own attorneys.. This is a good option for spouses who want to work together to create a resolution that is best for them. What will the court do in granting a divorce in Washington? The court will determine whether one spouse will pay maintenance (alimony) to the other, if requested by one spouse. This determination is made based on many issues including whether one spouse has the need for maintenance, and whether the other has the ability to pay it. he court will establish a residential schedule for the dependent children, and will also set an amount of child support..
What won't a court do in granting a divorce in Washington? The court will not cut the other parent out of your children’s lives (except in very extreme circumstances), so learning how to work with your spouse to make decisions for your children is best for your children and for you and your spouse. .